Hi everyone! Everyone on the Dolphin team is very excited for the impending release of Dolphin 5.0, which wraps up all of the incredible improvements throughout the 4.0 life cycle into one final build. While I am not a part of the Dolphin team, I headed the changes for the Melee netplay codeset, which was due for a few updates. Below is a list of useful information and changes! NOTE: Most of this info pertains to Melee only! In build 7840 (the current build used for netplay), there is a box in the controller settings that lets you choose "Direct Connect" for the Wii U GC adapter. In the new build, this option is gone. Instead, for each controller, you will choose "Gamecube Adapter for Wii U" as the controller type in the drop-down. Then, you can use the Configure button to enable/disable rumble. Build 7840 disables rumble by default for all players as part of the netplay codeset. This is a bother for people who use rumble, because they need to go into the settings and enable it every time they start a game. So, rumble is now enabled by default in the new build. 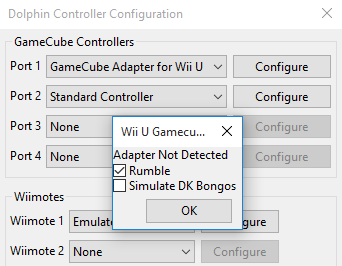 It's up to you to disable rumble in the controller settings if you don't want to use it (see above). That way, players can choose their rumble setting from Dolphin instead of having to deal with Melee menus to do so. The stage strike code has been updated. The stage select screen will now only show the stages enabled in the random stage select menu (tournament stages). You can press Z to display all of the stages again, and X strikes as usual. The separate, off-sync timer used by the game to retrieve the latest inputs has been removed. Inputs are now retrieved in sync with the game engine update, so that the latest inputs are retrieved immediately before they are used by the game. The hardware polling rate of the GC controllers has been doubled from 120Hz to 240Hz. Due to a combination of the above changes and updates to Dolphin, the formula for adjusting buffer is now different. One buffer is now equal to 4ms ping (previously 16ms). This means a ping of 32ms will have a buffer of 8 (ping/4). The number is higher than the last build, but that does not mean higher latency. It's just the way the formula works. I've made no changes to Melee's game engine in regards to display lag. After carefully investigating Melee's game loop, I concluded that the game engine requests drawing of the next frame as soon as possible after the frame update is processed. So, there were no corners I was able to cut in order to make the engine draw the frame any sooner than it is currently doing so. I would love to, but currently there is only a limited amount of space to store Gecko codes, and the current netplay codeset is completely out of room. A future build of Dolphin may provide more flexibility in where the codes are inserted, in which case we will add more features to the netplay codeset. The new netplay codeset is in the process of review for being merged into the main build of Dolphin. Smashladder plans to update to the new build when either Dolphin 5.0 or Dolphin 5.0 Release Candidate becomes available. This is tentative but should be happening quite soon, as the Dolphin team is quickly preparing for the 5.0 release. I will update this post once a firm release window is ahead. I will update this post if any new info arises. Please feel free to ask questions! Just once again clarifying that I am not a member of the Dolphin team and have only been working specifically with the Melee netplay codeset, so I apologize if I can't answer certain Dolphin-specific questions. There are many topics that should be trusted only to a core Dolphin engineer for an accurate answer or explanation.